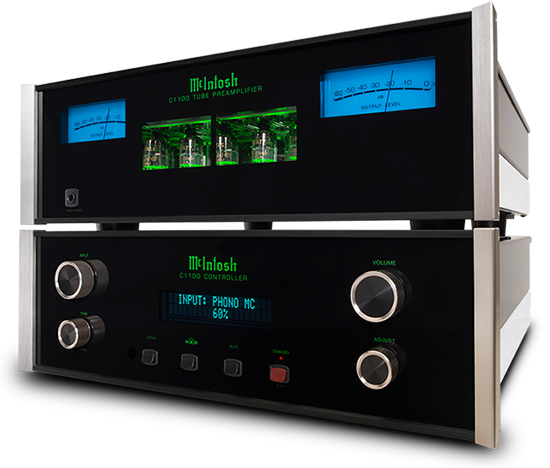 McIntosh’s newly announced C1100 tube preamplifier and controller pushes the limits of what’s possible. The C1100’s dual-chassis design produces less noise than any other McIntosh preamp ever made. Inside each, McIntosh electrically and mechanically isolates the left and right channels to allow true dual mono operation – giving you the ultimate stereo separation and sonic purity. A pair of high performance, shielded umbilical cables prevent outside noise from leaking into the audio signal between the Tube Preamplifier and Controller. Even in two separate units, they act in unison and are easily controlled with both the remote control or the C1100 Controller front panel. The C1100 houses many connections between the two pieces, so here’s a breakdown of what you get with the Controller and Tube Preamplifier. The Controller also introduces a dual microprocessor for an improved, robust control system. The Tube Preamplifier features 12 vacuum tubes (6 – 12AX7a and 6 – 12AT7). The C1100 has 4 more tubes compared to the C1000 which had 8 tubes. The C1100’s additional 4 tubes lowers dependency on any solid-state support. The amplifier circuit features a higher common mode rejection to reduce noise introduced by interconnect cables. For headphone listening, McIntosh uses a headphone jack with higher output compared to any other Mac preamp. The Headphone Crossfeed Director (HXD) adds depth and spatiality to your music. Use the Home Theater Pass Through feature to seamlessly integrate this into your existing surround sound home theater system. The C1100 preamp features McIntosh’s classic black glass front panels, blue meters, knobs, stainless steel chassis, illuminated logos, and custom machined brushed aluminum end caps. The C1100 can be matched with McIntosh’s amplifiers, speakers, room correction devices, CD players, turntables, tuners, and other sources for a complete home audio system. Available to order soon. See McIntosh’s website for more details.